I found this Cosmo Cosmetics Bag In-Store Try-Me such a good idea I myself put one in my wife’s shopping cart. Perfect for the simple woman, more perfect for a complicated one who needs to segregate Seasonal and Diurnal selections. Function is clearly illustrated, but the clincher was a single, color, Lay / N / Go hung for individual inspection. Step through all photos to consider the display design and selling proposition. Good thing I arrived early in the day. A number of units sold while I took my photos. 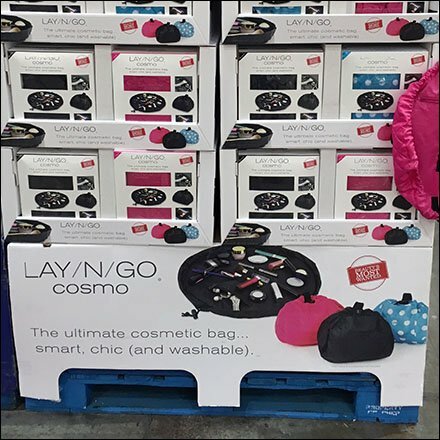 This Cosmo Cosmetics Bag In-Store Try-Me seen at Costco.